Solar system – Our Cosmic neighborhood Earth is just one of many bodies in our solar system. What else is out there. Read on to explore our cosmic neighborhood. The Sun is a very important star from our perspective as our own evolution is tied closely to the evolution of the Solar System. The Sun is a huge star which consists of around 98% material in the Solar System. The Solar System has planets that orbit our Sun and their respective moons, in addition to the comets, asteroids, dwarf planets, dust and gas. Eight planets form the most obvious members of the Sun&apos;s family after excluding Pluto which is recently dropped from the list of planets in solar system by the International committee on astronomy . A planet should be in an orbit around the sun. Planet should have sufficient mass to overcome forces from outside. Planet should not intersect the plane of the orbit of other planets. 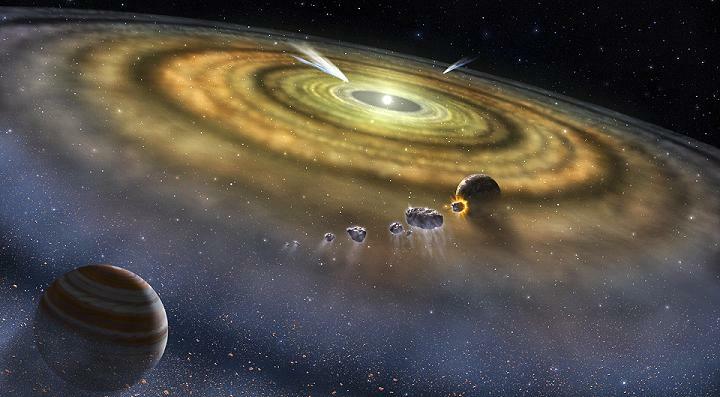 Evolution of Solar system The formation of the Solar System is estimated to have begun 4.6 billion years ago with the gravitational collapse of a small part of a giant molecular cloud. Sun is one of a few hundred billion stars in the Milky Way Galaxy, which together form a flattened disc shaped system which is roughly a hundred thousand light years across and a couple of thousand light years thick. The solar system is about two–thirds of the way out from the center to the edge of the disc, orbiting around the center of the disc. It takes about 225 million years to complete one orbit, at a speed of 250 km per second and this time period is called cosmic year. The stars of the disc form in groups out of a single large, collapsing cloud of gas and dust. Our Sun is formed this way about five billion years ago, completing about twenty orbits from its life time to date and is half way through its life cycle as of now. The cloud of stuff from which Sun and its family formed consists of mostly Hydrogen and Helium. The Protons of four Hydrogen nuclei combine to make one Helium nucleus. The total mass of the helium nucleus (alpha particle) is 0.7 percent less than the mass of four protons which combined and this mass is converted into pure energy every time this synthesis happens. Five million tones of of mass are converted into pure energy every second and in the last five billion years, Sun consumed about 4 percent of its initial supply with just 0.7 percent of that 4 percent is converted into radiation. The mass equivalent of energy radiated so far is about hundred times the mass of the Earth. In about five billion years from now, the Sun would consume all the Hydrogen present in it and may become white dwarf after another billion years or so. Hence, we need not worry about our source of energy for another five billion years. Without the Sun, Earth could not support life. Hydrogen atoms are fused together in the core of the sun to form helium atoms. This reaction generates an enormous amount of heat and light. Is the Sun a Big Ball of Fire? Not exactly. Although many people refer to the sun as a big ball of fire, the sun can more accurately be described as a thermonuclear reactor composed of hot plasma and strong magnetic fields. The sun itself is composed of mostly hydrogen and helium, with a small percent being made up of other elements like oxygen, carbon, neon and iron. The sun, due to its huge size and temperature variations, exhibits differential rotation; it rotates once in every 23.5 days. The sun&apos;s core produces Gamma rays that travel from the core to outer surface and by the time it reaches the surface, it is primarily visible light. Sun also emits a low density stream of charged particles (mostly electrons and protons) known as the solar wind which propagates throughout the solar system at about 450 km/sec. The solar wind and the much higher energy particles ejected by solar flares can have dramatic effects on the Earth ranging from power line surges to radio interference to the beautiful aurora boralis (the “Northern Lights” caused by the interaction between the solar wind, the Earth&apos;s magnetic field and the upper atmosphere). The sun has a Magnetosphere (Heliosphere/Magnetic Field) extending beyond Pluto. The planets near the sun such as Mercury and Venus probably had some liquid in their early days, but were completely burnt out due to their proximity to sun. 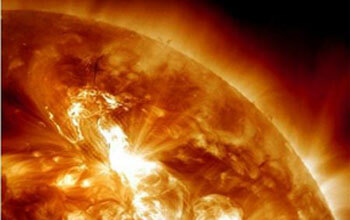 Scientists say that if Earth had been even slightly closer, wouldn&apos;t have had any life due to the sun&apos;s extreme heat. Mercury Mercury is the smallest planet in our solar system - only slightly larger than the Earth's moon. It is the closest planet to the sun at a distance of about 58 million km (36 million miles) or 0.39 AU. Planets are basically classified as Terrestrial and Jovian planets. Mercury is the closest planet to the sun, named after the Roman messenger God Mercury, as Mercury is fast and takes only 88 days to revolve around the Sun. The diameter around the equator is 4879 Km. Mercury is the second densest planet in the solar system after the Earth. The only spacecraft to approach Mercury so far has been NASA&apos;s Mariner. It has observed various aspects of the atmosphere and surface of Mercury. Mercury has thin atmosphere consisting of Oxygen, helium and Hydrogen. The magnetic field exerted by Mercury is only 1% of Earth&apos;s magnetic field. The main elements found on Mercury are sodium, potassium and iron. The surface conditions in Mercury are harshest in the Solar System. During the long Mercurian day the temperature rises to about 425 degrees Celsius, hot enough to melt lead and hotter than any planet except Venus. Because there is no substantial atmosphere to retain heat, during the equally long nights, the temperature drops quickly to around –180 degrees Celsius, which is among the coldest found in the Solar System. This range of −180° Celsius at night to 425° Celsius in the day is the largest surface temperature variation in the Solar System. Venus Venus is the second planet from the Sun and is the second brightest object in the night sky after the Moon. Venus is also known as evening star. It is the brightest planet to appear to the naked eye. The name Venus was given to it from the ancient Goddess of Beauty. There have been many expeditions that have attempted to study the atmosphere and surface of Venus. The first one was mariner 2 in the year 1962. Many later expeditions have studied the atmosphere in detail. There is a great temperature variation on Venus varying from 462 degree Celsius to −170 degree Celsius. 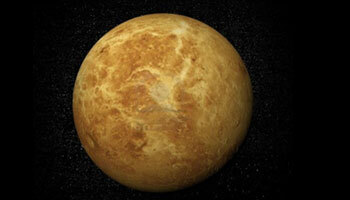 Venus has 82 percent of the mass of Earth and a diameter of about 12,104 km. The atmosphere consists of 98 percent carbon and 2 percent nitrogen with traces of few other gases. 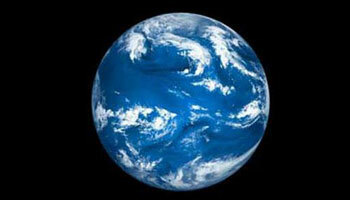 Earth The planet is home to millions of species of life, including humans. Both the mineral resources of the planet and the products of the biosphere contribute resources that are used to support a global human population. Earth our home is a fascinating planet, out of all planets of the solar system, since it is the only planet in the solar system that supports life according to information available till now. It is the densest planet in the solar system. The only planet to have large parts of it covered with water. Earth is subjected to a lot of volcanic and seismic activities like continental drift, tectonic plates, tsunamis and periodic global warming and cooling. Earth has a strong Magnetic field due to its iron core and tilt in its axis. Earth move from west to east at 20kms/sec and this causes the various drifts and continental shifts. Mars Mars is a terrestrial planet with a thin atmosphere, having surface features reminiscent both of the impact craters of the Moon and the volcanoes, valleys, deserts, and polar ice caps of Earth. Mars is the last terrestrial planet in the solar system and the name Mars is given from the ancient God Mars (God of war). It is a reddish planet with swathes of orange. 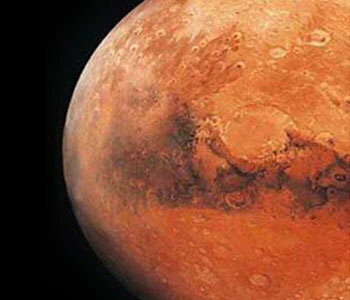 Scientists say that Mars is red as the surface is highly oxidized Iron. Mars has two satellites (Phobos and Deimos) which scientists believe as asteroids captured by Martian gravitation. There are some spectacular features of Mars that are peculiar. Scientists for many years have believed that there could be life on Mars, as they believe that there is ice and methane on Mars. Future expeditions to Mars will find out more about this aspect. Jupiter Jupiter is the largest planet in the solar system. Jupiter is so large that all of the other planets in the solar system could fit inside it. 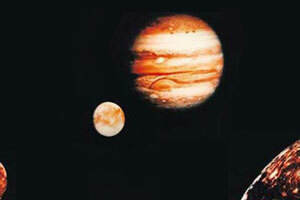 More than 1,000 Earths would fit inside Jupiter. Jupiter is the biggest planet of solar system. Its name originates from the Greek God Zeus who was the father of all Gods in Greek mythology. Jupiter with a diameter of 143,000km and mass 318 times the mass of the Earth is the largest planet in the solar system. The magnetic field of Jupiter is 14 times as powerful as Earth. Jupiter is famous for the big red spot on its surface. It has been observed that the red spot is as big as Earth. The Great Red Spot, which is south of the equator is an anticyclonic storm blowing since 340 Years. Jupiter has rings that are very dark and are not as visible as that of Saturn. There are 63 moons of Jupiter of which four are the principal Moons (Galilean moons Io, Europa, Ganymede and Callisto). 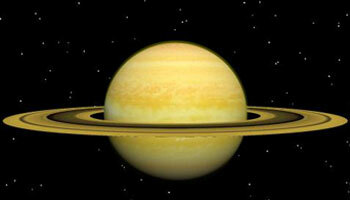 Saturn Saturn is the sixth planet from the sun and the second largest planet in the solar system. Saturn is a gas giant made up mostly of hydrogen and helium. Saturn is the sixth planet of the solar system Saturn is a smaller Jupiter with diameter 9.4 times that of Earth and a mass 95 times that of Earth. Saturn has a beautiful appearance with the famous rings which are mostly made of rocks and ice. The atmosphere of rings has mostly molecular Hydrogen and Oxygen. Though they look continuous from the Earth, the rings are actually composed of innumerable small particles, each of them moving in an independent orbit. They range in size from a centimeter or so to several meters. The voyager Cassini revealed more about the rings and other features such as the spokes of the rings. Satellites around Saturn include Titan which has a thick atmosphere made of nitrogen and methane. Uranus Uranus is the seventh planet from the Sun and was the first planet to be discovered with the use of a telescope. Uranus’ most unique feature is that its axis sideways in comparison to other planets i.e. its north and south poles are in line with where other planets have their equators. Uranus name is derived from the Greek God of Sky. It was discovered by Sir William Herschel, but believed that it was a comet. 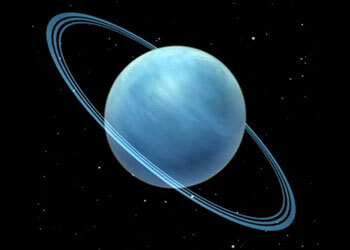 Uranus was thus the first planet to be discovered, as it was not visible to the ancients. Uranus distinctive feature is that it is tilted at 98 degree on its axis. Right now Uranus&apos;s South Pole is pointing almost directly at the Sun and its north pole is in complete darkness. As the planet slowly circles the Sun, the part facing the Sun gradually changes. In 42 years, it will be the North Pole that receives the feeble rays of the distant Sun and the South Pole that is shrouded in darkness. Uranus has a narrow system of rings. There are at least nine rings encircling the planet. These rings are only 10,000 Kms in width compared to several thousand kilometers width of Saturn rings. Unlike Jupiter and Saturn, Uranus doesn&apos;t generate as much energy as it absorbs. Uranus has 27 moons. Neptune Neptune is the eighth planet from the Sun and the smallest of the gas giants. Neptune was the first planet found by mathematical prediction after unexpected changes in the orbit of Uranus were observed. Its name is derived from Neptune the Roman god of Sea. This is due to its deep blue color. 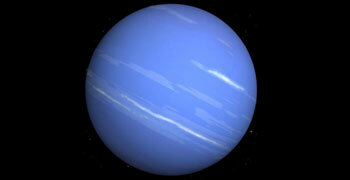 Neptune is known for its great winds that are the fastest for any planet in the Solar system. The winds blow at a speed of 2500 Km/h. It has a system or rings that are faint. Neptune has 13 moons. There are four asteroids that circle Neptune; these are known as Trojan Asteroids. 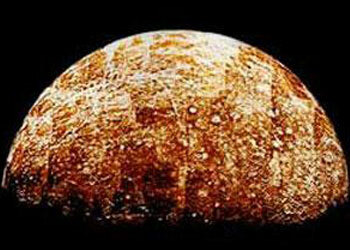 Pluto Pluto was known as the smallest planet in the solar system and the ninth planet from the sun. 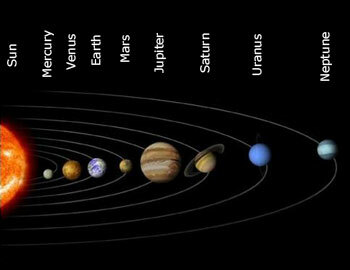 Today, Pluto is called a "dwarf planet. Pluto is now considered as a Dwarf Planet because according to the new definition, it fails the minimum requirements to be a planet. Do you know that it was named after the God of Underworld (Death)? The strange feature of Pluto is that it is tidally locked with its Satellite Charon. Charon presents the same face to Pluto and Pluto presents the same face to Pluto all the time. New Horizon probe sent recently (June, 2006) will reveal more about Pluto in the year 2015. Pluto has three Moons (Charon, nix and Hydra).